There are many factors that negatively impact the performance of a .NET Core application. Sometimes these are minor things that were not considered earlier at the time of writing the code, and are not addressed by the accepted best practices. As a result, to solve these problems, programmers often resort to ad hoc solutions. However, when bad practices are combined together, they produce performance issues. It is always better to know the best practices that help developers write cleaner code and make the application performant. This tutorial is an extract from the book, C# 7 and .NET Core 2.0 High Performance, authored by Ovais Mehboob Ahmed Khan. The boxing and unboxing methods are not always good to use and they negatively impact the performance of mission-critical applications. Boxing is a method of converting a value type to an object type, and is done implicitly, whereas unboxing is a method of converting an object type back to a value type and requires explicit casting. For mission-critical applications, it’s always better to avoid boxing and unboxing. However, in .NET Core, we have many other types that internally use objects and perform boxing and unboxing. Most of the types under System.Collections and System.Collections.Specialized use objects and object arrays for internal storage, and when we store primitive types in these collections, they perform boxing and convert each primitive value to an object type, adding extra overhead and negatively impacting the performance of the application. Other types of System.Data, namely DateSet, DataTable, and DataRow, also use object arrays under the hood. Types under the System.Collections.Generic namespace or typed arrays are the best approaches to use when performance is the primary concern. For example, HashSet, LinkedList, and List are all types of generic collections. 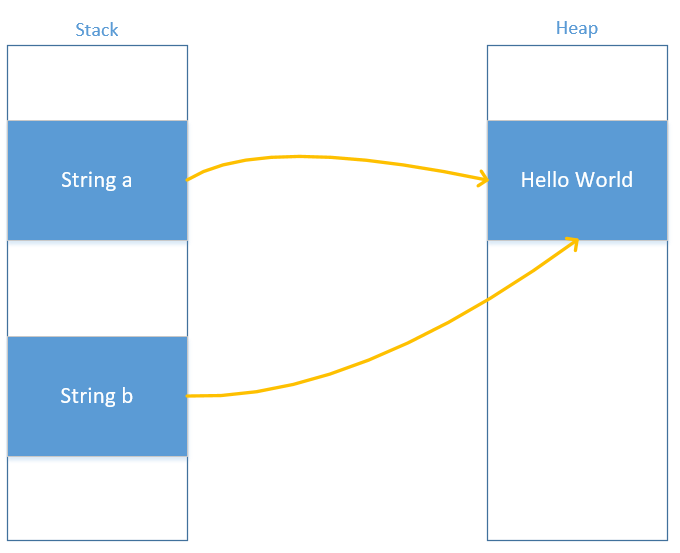 In .NET, strings are immutable objects. 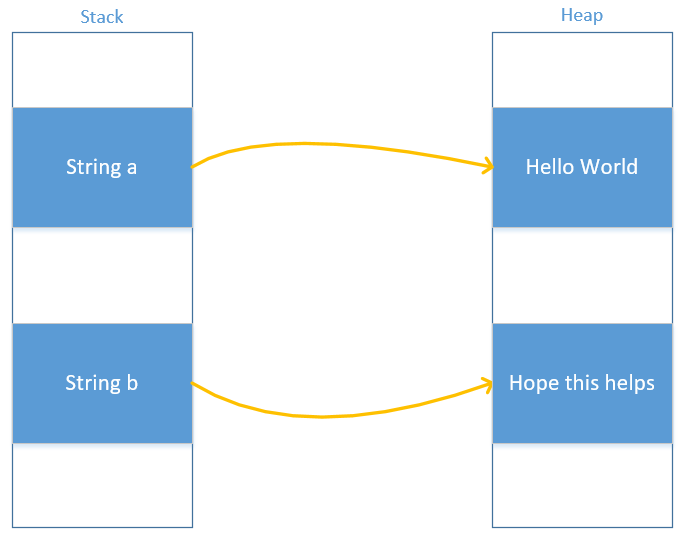 Two strings refer to the same memory on the heap until the string value is changed. If any of the string is changed, a new string is created on the heap and is allocated a new memory space. Immutable objects are generally thread safe and eliminate the race conditions between multiple threads. Any change in the string value creates and allocates a new object in memory and avoids producing conflicting scenarios with multiple threads. With each change in the string, the object allocates a new memory space. In some cases, it may be an overkill scenario, where the frequency of string modification is higher and each modification is allocated a separate memory space, creates work for the garbage collector in collecting the unused objects and freeing up space. In such a scenario, it is highly recommended that you use the StringBuilder class. Always use a specific exception type or a type that can catch the exception for the code you have written in the method. Using the Exception type for all cases is not a good practice. It is always a good practice to use try, catch, and finally block where the code can throw exceptions. The final block is usually used to clean up the resources, and returns a proper response that the calling code is expecting. In deeply nested code, don’t use try catch block and handle it to the calling method or main method. Catching exceptions on multiple stacks slows down performance and is not recommended. Always use exceptions for fatal conditions that terminate the program. Using exceptions for noncritical conditions, such as converting the value to an integer or reading the value from an empty array, is not recommended and should be handled through custom logic. For example, converting a string value to the integer type can be done by using the Int32.Parse method rather than by using the Convert.ToInt32 method and then failing at a point when the string is not represented as a digit. KeyNotFoundException argEx = new KeyNotFoundException("
Error occured while executing GetCountryDetails method. Throw exceptions rather than returning the custom messages or error codes and handle it in the main calling method. When logging exceptions, always check the inner exception and read the exception message or stack trace. It is helpful, and gives the actual point in the code where the error is thrown. For and foreach are two of the alternative ways of iterating over a list of items. Each of them operates in a different way. The for loop actually loads all the items of the list in memory first and then uses an indexer to iterate over each element, whereas foreach uses an enumerator and iterates until it reaches the end of the list. Delegates are a type in .NET which hold the reference to the method. The type is equivalent to the function pointer in C or C++. When defining a delegate, we can specify both the parameters that the method can take and its return type. This way, the reference methods will have the same signature. The preceding code seems pretty straightforward and optimized, but under the hood, it has a huge performance overhead. In .NET, delegates are implemented by a MutlicastDelegate class that is optimized to run unicast delegates. It stores the reference of the method to the target property and calls the method directly. For multicast delegates, it uses the invocation list, which is a generic list, and holds the references to each method that is added. With multicast delegates, each target property holds the reference to the generic list that contains the method and executes in sequence. However, this adds an overhead for multicast delegates and takes more time to execute. If you liked this article and would like to learn more such techniques, grab this book, C# 7 and .NET Core 2.0 High Performance, authored by Ovais Mehboob Ahmed Khan. The article is very good. But I can’t see complete boxing/unboxing examples. The code is missing. Kindly provide that if possible.